Dog ads are more about politicking and who’s in the photo than about reaching potential buyers but informative ads could serve the public and new breeders while educating dog show judges. Now before you get mad about the political purpose, follow this trained observer’s point of view. I've been educated over the last couple of years. So all that advertising isn't just buying notice, those photos and the dog's win-record can be educational for newer dog show judges. I’ve been known to thumb through show dog magazines. Nearly two years ago I suggested that a would-be breeder looking for a purebred dog would have to stumble over the fact that there’s a dog show nearby. Nothing has changed. If a local breeder or family does go there, well, they are going to be disappointed because the dogs are either shut up in big rigs, being prettied up, or they are in the show ring. They can’t be touched and nobody has time to talk. My daughter who is all excited about her new hobby became thoughtful. I know the look. If a prospecting pet owner tries to strike up a conversation with the person holding the leash, they are politely rebuffed. She raised an eyebrow. I reminded her that I’ve checked the lay of dog show land. So I moved forward, observing that dog show folks only want to impress judges and each other. I suggested that dog clubs use their advertising budget to promote their presence instead of crowing about who is judging. 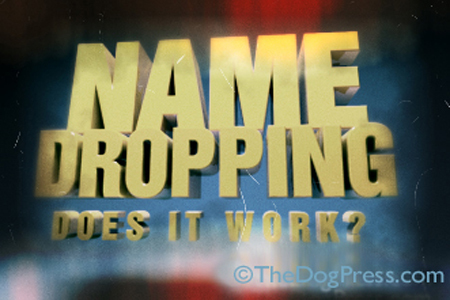 The name dropping means nothing to folks looking to buy a family dog. To the dog-seeking public, dog show people appear as rich, snobby, self-indulgent owners and harried, short-tempered dog jockeys. Some ads even pictured two or more judges and enumerated wins under those judges as well. Show dog ads are clearly more about the judges than the dog. To the average page thumber, the dog is an afterthought. I said it was about marketing, including the judge, not about being proud of the dog. My kid got into it, laughing as we noted that the dog’s call name is always prominently emblazoned in the ad but the breed is never identified. She acknowledged the frustration a family must feel if they pick up one of those magazines at a dog show. Pulling a smirky-face, she said advertisers should state the breed “for judges unfamiliar with that breed.” Took a second but I got it. To an outsider, it appears that the purpose of advertising is to publicly thank the judge and claim credibility according to the stature of the handler. In some ad layouts, usually those done by a professional photographer or advertising agency, it’s hard to find the owner’s name. We decided the more prominent the name, the more likely it was an owner-submitted project, a “newbie” as she called them. I noted that most of the big wins carried a consortium of owners taking credit (and paying the bills) for the dog. Rarely is any credit given to the breeder or bloodline. We counted, less than half the pages mentioned a breeder. I also learned that sometimes the dog’s registered name is deliberately omitted if it isn’t a “recognized kennel name.” I guess there’s nothing to be gained by having “discovered” a remarkable dog from an unremarkable kennel or breeding program. What does all this mean? My objective assessment is that breeding show dogs isn’t the primary goal for most folks. My daughter demurred, stating that breeder/owner handlers can be successful in dog shows. She laughed when I pointed out that she still believes in the tooth fairy. No, I’ve chatted up enough folks at shows to draw the conclusion that dog show success depends on two things: one’s ability to do a lot of vanity ads (advertising the judges) and hiring a top handler to promote the dog. I also acknowledge that only the top handlers can recognize show ring potential in a young dog. They are the spotters for people who have no “breeding program” and thus, haven’t developed the eye for a winner. The way I see it, if the dog stands still for the judge, then flies around the ring, and he’s a “showing fool” the dog handler will buy it for a client and with the right marketing, the dog will win, the handler gets paid, and everyone gets happy. I just might come out of retirement and start up an advertising agency. Kidding of course but I just checked with this website's advertising people and Dennis said "advertising done right is educational for judges and new breeders". OK, my daughter said that is true so I'm softening my position on what I thought were just "vanity ads."